White is the presence of all color and black is the absence of color. In print we start off with all color in the white paper to which we add our ink. We are, in effect, subtracting from white color as we add the various blends of CMYK. Thus CMYK is subtractive color. CMYK is a color space used to describe colors reflected from opaque colors such as paint or printer inks. 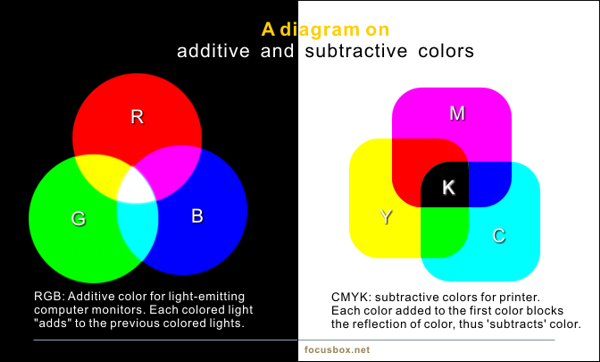 The three primary subtractive colors are cyan (C), magenta (M), and yellow (Y). The more color you add, the darker the final color is. When we add primary color magenta (M) to another primary yellow (Y), magenta masks yellow and we get red as the result. When we mix all three subtractive primary colors by adding a third primary color cyan (C), the result is black. At this point you may be asking about the K or black color component of CMYK. Well, you don’t need black or K to make black. 100% of CMY makes black. It does this by subtracting all the color present in a white paper. In all practicality, other than a severe registration test for your printer, you would be wise to print black type with just black. Second, if your image has a solid black background, imagine how much ink you’re pouring onto the paper by using solid CMY — too much for good offset printing. Besides, you wouldn’t like the black you get from 100% each of CMY since it’s somewhat muddy and not as rich or deep as you would want for a good crisp image. Moreover, by adding black you are getting better grays and significantly adding to the amount of colors you can achieve. When you turn your computer off, you’re probably are looking at a black screen. Thus, if CMYK is subtractive color because you’re starting off with all colors, red, green and blue (RGB) is additive color because you’re starting off with no color, a black screen, and adding color. Unlike the shades of colors in CMYK, which are varied using dots, RGB color shades are varied by using levels of brightness from the electronic source: a cathode ray tube (CRT), a liquid crystal diode (LCD), or from another electronic methods. Diagram below is a simulation of the two color spaces. So there you have it — on-screen color is RGB and print is CMYK. In effect, the two are opposites since again, one is subtractive color and the other is additive color. When you manipulate and create images in the digital environment, it’s all RGB — although programs like Adobe Photoshop allow you to convert to CMYK and effectively simulate the CMYK color space on-screen. (Photoshop is actually working behind the scenes in another color space but let’s not get into that.) The key point is that since on-screen is RGB, you have to convert to CMYK to print. You don’t even think about this when you output to your laser or inkjet printer as it automatically converts RGB into CMYK. Why then do commercial printers make such a big deal about getting RGB files when they can easily convert RGB to CMYK? The reason is that long before digital files came along printers were using CMYK. It’s part of the fabric of their very existence and it’s how they relate to color. Moreover, the conversion is not perfect. So the printer would rather not take the responsibility of being held accountable for color shifts. Another problem is the possibility of a rich black. Because RGB doesn’t have a specific black component like CMYK there’s the chance that black might convert to 100% each of CMY as opposed to K.